Belshazzar the son of Nebuchadnezzar, (who is now apparently king even though nothing is mentioned about the end of Nebuchadnezzar’s reign) makes a great feast, with the gold and silver vessels taken from the temple at Jerusalem. Those attending the feast drink wine, and praise false gods. During this feast and party, a hand writes a message on a wall. Belshazzar is troubled, and wishes to have the writing read and interpreted. The queen recommends Daniel, who had been so good at interpreting before. So Daniel is called in, and upon arriving Daniel sees the writing “MENE, MENE, MENE, TEKEL, UPHARSIN” on the wall; Daniel says that Belshazzar has not humbled his heart like Nebuchnezzar. This is the interpretation given by Daniel: God has numbered your kingdom, you have been weighed in the balances, and found wanting and your kingdom is to be given to the Medes and the Persians. Belshazzar honors Daniel, but that night he is slain, and the kingdom falls to Darius the Median. Essentially, these leaders hatched up a plan to persuade the king to sign a decree saying that anyone petitioning a god or man other than Darius will be thrown into a den of lions. King Darius signs this decree and sets it into law. 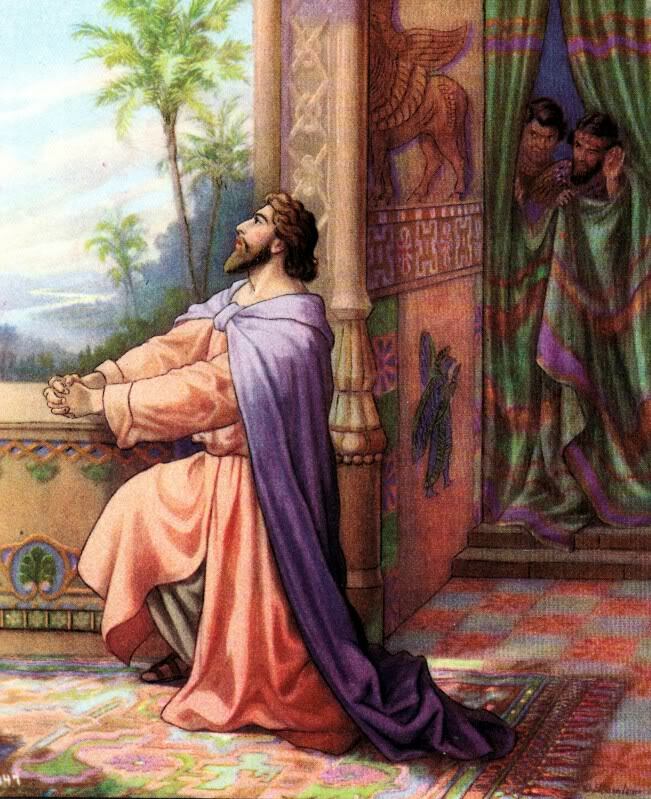 When Daniel hear that the law was in effect; “…he went into his house; and his windows being open in his chamber toward Jerusalem, he kneeled upon his knees three times a day, and prayed, and gave thanks before his God, as he did aforetime.” (Daniel 6:10) Report reaches Darius that Daniel has prayed to his God. Even though Darius does not want Daniel to die, he is bound by law and has no other choice but to follow the law he signed. 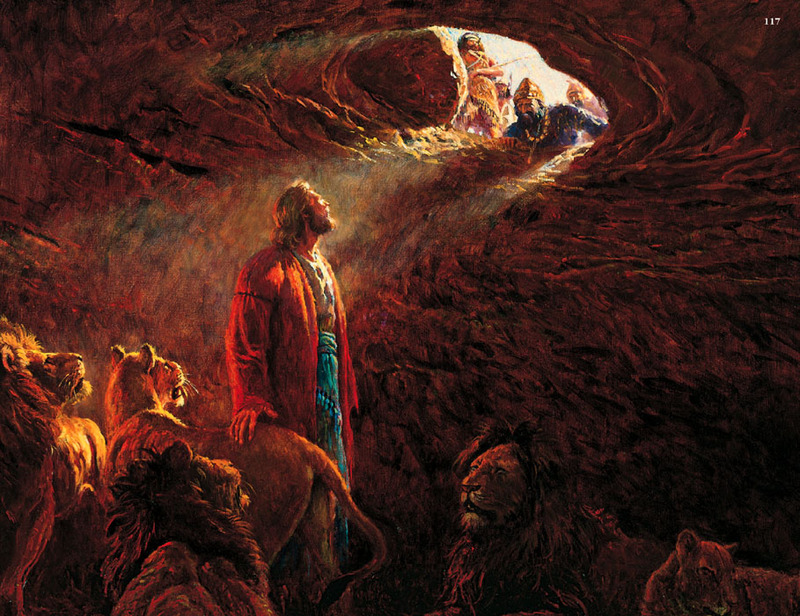 So Daniel is thrown into the lion’s den; Darius tells Daniel that his God will protect him. The King seals the den and goes home and fasts all night long, and is not entertained by musicians or does he sleep. King Darius awakes early the next morning and runs to see if Daniel is still alive. Daniel is found alive and yells to the king; “…O king, live for ever. 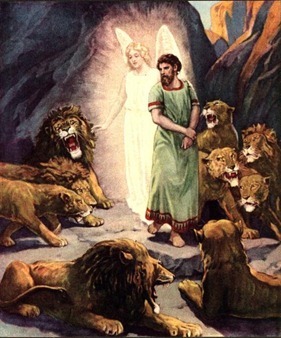 My God hath sent his angel, and hath shut the lions’ mouths, that they have not hurt me…” (Daniel 6:21-22) Darius calls Daniel the servant of the living God. Darius was angered at the situation and called for those who had accused Daniel and has them, their wives and children thrown into the Lion’s Den. “…and the lions had the mastery of them, and brake all their bones in pieces or ever they came at the bottom of the den.” (Daniel 6:24) Darius decrees that all must honor the God of Daniel. Daniel prospers. This entry was posted in Daniel, Old Testament and tagged Belshazzar, Daniel, Darius, Den, God, Jerusalem, Lion, Lion's, Lion's Den, Mede, Writing on the wall. Bookmark the permalink.